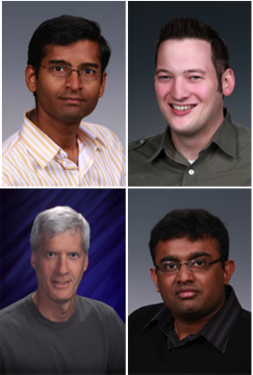 Clockwise from top left: Krishnamoorthy, Daily, Vishnu, and Palmer, from the HPC group, wrote the chapter on Global Arrays in a new book about parallel computing models. Four research scientists from the High Performance Computing group (part of PNNL’s Advanced Computing, Mathematics, and Data Division)—Sriram Krishnamoorthy, Jeff Daily, Abhinav Vishnu, and Bruce Palmer—contributed a chapter to the recently published book, Programming Models for Parallel Computing. In their chapter, simply titled “Global Arrays,” they describe the origins of the distributed-memory programming model as a communication layer for the Northwest Computational Chemistry Package, more commonly known as NWChem, modeling code that performs quantum chemistry calculations to its current capability in developing high-performance parallel programs beyond those associated with computational chemistry. Global Arrays can now be used with particle-based algorithms, including molecular and smoothed particle dynamics, and grid-based algorithms, such as those employed in fluid dynamics, reactive flow modeling, and atmospheric data analysis. Global Arrays also has been used to parallelize Subsurface Transport Over Multiple Phases (STOMP), a general-purpose tool for simulating subsurface flow and transport, and the GridPACK™ framework for simulating the electrical power grid. Krishnamoorthy S, J Daily, A Vishnu, and B Palmer. 2015. “Global Arrays.” Chapter 5 in Programming Models for Parallel Computing, ed. P. Balaji, pp. 113-128. The MIT Press, Cambridge, Massachusetts (available at https://mitpress.mit.edu/programming).